For students to think about Latin America before Europeans arrived and question the Euro-centric version of American history they have encountered. Show students two maps of the world. One from now and a colonial map. Students are asked to point out how they are different. Explain to students that some countries used to control other countries. Point out specific countries and ask students to guess what countries once controlled them. Explain that this is why we speak English in Ireland and the USA, and why Spanish is spoken in Peru and Columbia. Show students a photo of Columbus’s ship and tell them that they are going to learn about Christopher Columbus. Explain that the name is different in Spanish Cristobal Colon not Christopher Columbus. Ask students to talk to their partners about who Christopher Columbus was. Elicit some responses. 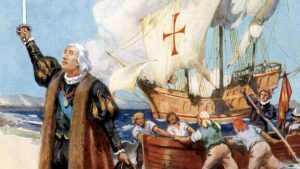 Tell students they will be doing a short reading about Christopher Columbus. After reading the text and discussing the answers, students are asked to talk to their partners about what the indigenous people of America might have felt when Columbus arrived. Then they are asked to write three sentences from the perspective of an indigenous person who sees Columbus ship arriving (in Spanish or English, depending on level). 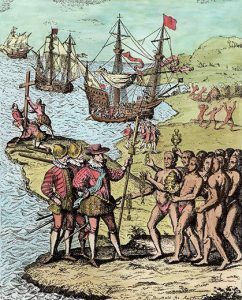 Ask students to look at their history textbooks and see how the story of Colón and other European explorers is depicted. Do they think it adequately describes the story from the perspective of the indigenous people. Ask the to draw up alternative textbook materials that look at the story from other perspectives and share them with the history teachers in the school.